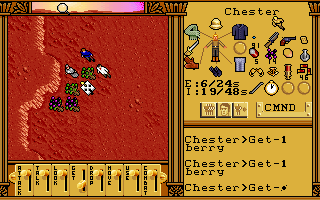 My characters, who wouldn't survive on the red planet, pick berries, which wouldn't grow there. At some point in her childhood, Irene became a fan of The Brave Little Toaster, a 1987 film about inanimate objects who become animated when their owner isn't around and show unwavering loyalty to him despite the fact that they're almost certainly destined for a dumpster. (How they didn't sue the makers of Toy Story is a mystery to me.) I didn't care for the film, so I didn't much care when, some years after we met, she discovered that the film had a sequel. I only remember that she was watching it in the living room one weekend afternoon while I was messing around on my computer--probably playing an RPG. I got up at some point to get a snack and, walking past the living room, I heard the unforgettable line, "Me--a little toaster--the Supreme Commander of Mars! Wow!" For years, without even knowing the context, I held up that one line, heard in isolation, as the prime example of the most absurd plot point that could ever exist. That was before I rescued from a Martian cave a man named Cooter McGee, who was hiding from Rasputin, and got, as a reward, a map to some rocks that release oxygen when you chew them. There's a dialogue suggestion that we might not even be on "real" Mars. I don't know how this is going to play out, but I'm willing to bet it will be stupid. I hate this game. I hate it beyond its faults. I hate it while recognizing that it's not objectively bad. 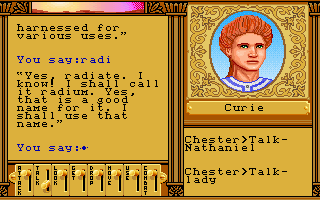 I continue to like the Ultima VI engine. I just hate what they've done with it here. I like talking to NPCs by keyword, but I hate these NPCs. I like the combat system, but I hate the actual combats against these stupid, meaningless foes. Most of all, I hate what the game has done to my favorite game mechanic: open exploration. There's nothing I like more than being cast adrift into an open game world, where I can explore the landscape and visit ruins in essentially any order, learning neat things about the history and lore of the setting. Martian Dreams offers that gameplay but perverts it by ensuring that anything I find is going to be stupid. Every ruin is going to fill in the backstory of a Mars with a breathable atmosphere that dozens of people have visited after being shot out of a cannon. Every NPC is going to be some VIP from the Victorian Age with no depth or wit to his characterization beyond the initial, "Hey! It's Marie Curie!" or "Hey! It's Buffalo Bill Cody!" Hey! I led her to come up with the name "radium"! Somehow, I've let over a year elapse since my last attempts to play Martian Dreams. The reasons for this were partly thematic (i.e., my reaction above) but mostly technical. The issues with saving and crashing really bothered me. I don't mind working around bugs when I can clearly define them, but when the solution is ambiguous ("don't save near the equator"), it just creates a paranoia throughout my entire gameplay. Especially in this case, where the consequences are both dire and not immediately clear: you can never save the game again, and it continually crashes after you successfully save the game twice. I downloaded a DOSBox version with save states and found that it works reliably as long as I don't close the session in which the save states are created. If I do that, all bets are off. So I waited until I knew I was going to be home for a three-day stretch on President's Day weekend and determined to finish the game in one go. I'll quickly recap the beginning of the game below, but please refer to my first and second entries for a full discussion of the silly backstory, how I feel about what the games did to the "avatar" concept, and the initial game moments. Restoring power to Mars is clearly going to be part of the plot. If you'll recall from the backstory, the Avatar and Dr. Spector (from Savage Empire) have followed clues given by a disguised alien to travel back in time to 1895 to Nikola Tesla's lab. Two years prior, a malfunctioning "space cannon" had sent a group of dignitaries to Mars from the Chicago World's Fair. Realizing that history will forever be altered if Thomas Edison, Andrew Carnegie, Theodore Roosevelt et. al. 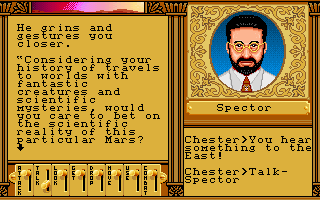 remain on Mars, Dr. Spector conceives a rescue mission involving the Avatar, the journalist Nellie Bly, Sigmund Freud, Tesla, a cowboy named Dallas Garrett, and a doctor named C. L. Blood, whose full Wikipedia article has been the best thing to come out of my playing this game. Sigmund Freud offers an interesting character-creation mechanism. I created a new character and went through Dr. Freud's pscychoanalytical character creation again, choosing responses that made me a male character with decent strength. As before, the game started in the rescue mission capsule with Nellie Bly and Dr. Spector in my party. I loaded up on cold-weather gear, guns, and tools for everyone (though as we'll see, not enough), pried my way outside, and headed for the wreckage of the crashed 1893 expedition. There, as before, I encountered a Lt. Dibbs, who had been commander of the ceremonial guard at the British pavilion. Dibbs gave me the rundown of how the previous dignitaries had fractured and dispersed. Buffalo Bill Cody and Calamity Jane set up a trading outpost. Percival Lowell's group settled in the Martian city of Elysium and used something called a Dream Machine until they went mad and started believing they were Martians. This is later confirmed by another NPC. A group led by someone named Jack Segal (no idea on the historical analogue) settled at Olympus and began constructing another space cannon to return to Earth. They refuse to allow anyone "contaminated" by the Dream Machine into their compound. Finally, Grigori Rasputin led a group to the Martian city of Argyre to investigate dangerous Martian technology. 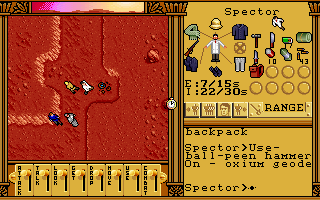 I took the party, now with Lt. Dibbs, to Buffalo Bill's outpost and got Cody's quest to rescue Cooter McGee, a prospector who has been supplying the outpost with Oxium. Oxium is a sponge-like rock that releases oxygen when chewed. It both serves as a currency and prevents your characters from suffering attribute drains associated with oxygen deprivation. This was as far as I had made it in 2015. Every time I tried to visit McGee's place, the game crashed at a specific place along the way. The bug seemed to be associated with the general saving bugs. Since I was saving only by save-state this time, I was able to breathe a sigh of relief when the party passed the same area with no problem. By using the sextant and following the coordinates given by Cody, I found McGee's cave without too much trouble. Cody had also given me some berries and said something about needing them to access McGee's cave. Thus, even though it didn't seem to make sense, I turned to them when I reached an uncrossable chasm with a board on the other side. It turns out that the berries, which I guess are blue, convey ESP and allow you to move objects from a distance. I'm not sure how long they last, but I was able to move the plank across the chasm and enter McGee's residence. Maybe there was a better way to say that I've acquired ESP? I looted his crates and boxes for ammo and such, and searched around until I found a couple of notes. One indicated that McGee was being harassed by Rasputin for information on the location of Oxium lodes. The other was a note from Rasputin telling McGee to meet him at a cave "in the middle of the Coprates Chasma" and bring his Oxium map. The official game map had the location of the chasma; it was basically an extension of the network of chasms I was already in. This would be a good time to talk about navigating the game. After this session, I realized I would have to bring the official game map into something like Paint and start annotating it, because it shows neither coordinates nor the locations of key geographical features like bridges. The landscape, which allows you to walk around the entire circumference of a planet more than half the size of ours, is bisected by chasms ("chasmata" in geo-speak), canals, and other geographic features that can make navigation a nightmare. You might be at 20N 140E and have to go to 25N 150E but end up walking for hours until you find the right combinations of bridges and chasma entrances to get there. The game world is more like a maze than an open world. That isn't necessarily a complaint; it actually adds a dimension of puzzle-solving to the game once you realize what's happening and what you need to do to solve it. To get to the north end of this screenshot, I first have to find my way out of this chasm. More annoying than the navigation are the enemies that you encounter along the way. They seem both more numerous and more persistent than their counterparts in either Ultima VI and Savage Empire. In those games, if I didn't want to fight, I could usually just walk away. Not here. Once a "creeping cactus" or "sextelleger" has you in his sights, he follows you relentlessly until you give up and turn and fight. Enemies often attack in large swarms that overwhelm the party, and I found myself doing something in this game that I rarely did in either of its predecessors: reloading. 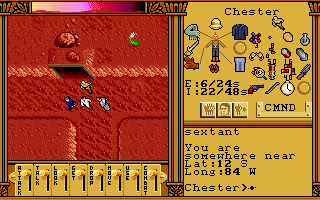 Fighting off a group of "creeping cacti," which use similar animations as slimes in Ultima VI. The only upside to all the combat has been fairly rapid character development. 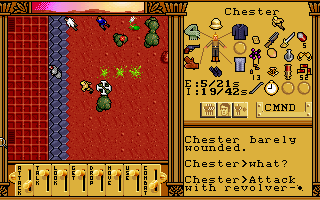 In contrast to Savage Empire, where everyone started at Level 6 and maybe leveled up once during the game, in this game plenty of NPCs start at Level 1 or 2. The Avatar starts at Level 4. Almost every time I sleep, someone levels up. This is accompanied by a dream in which the character sees an obelisk and can touch it with a sword, heart, or book, corresponding to a 1-point bump in strength, dexterity, or intelligence. (Although there are no spells in this game, intelligence is apparently important for using some weapons and the duration of the berry-conferred telekinesis.) This same mechanism was done with animals in Savage Empire. Nellie levels up. I'm still not sure why the heart/love is associated with dexterity. Leveling up occurs during sleeping, which you do frequently because an insulated tent (found among the opening supplies) is the only way to get out of the cold. Once 18:00 falls, characters without sufficient protection start taking damage from the cold. A few hours later, almost everyone does (I haven't been able to figure out the exact combination of clothing I need to keep warm). So you have to stop and sleep until dawn just to survive. I don't know what my companions back in the capsule are doing. Anyway, back to the plot. I found McGee in the cave in Coprates Chasma after fighting some Martian critters and moving a barricade of boxes. McGee related that he'd found a mother lode of Oxium, but it was behind some kind of powered door and there's no electricity running on Mars any more. He suggested that Thomas Edison, living at Olympus, might be able to help get the power running again. He gave me directions to where he'd buried the map to the mother lode and then headed back to his own cave. During the conversation, he mentioned three explorers who have been planting marker flags around the planet. Their names are Sherman, Yellin, and Duprey. You know where this is going. I found his map, and based on the canal configuration around it, it seems to correspond to an area in the northeast section of the game map. The next obvious step seemed to be to head to Olympus and speak to Edison. Dibbs knew the coordinates of the city, but when I arrived, the gate guard, Nathaniel, refused to let us inside unless we could get a voucher from three people who could certify that we weren't insane (i.e., not affected by a Dream Machine). Dibbs suggested the trio of explorers mentioned by McGee, and Nathaniel agreed. Nathaniel indicated that they were last seen headed to Syrtis Major and he gave me the coordinates. Getting to the location took longer than most of the game I'd played already, thanks to the navigation issues described above. On the plus side, I ended up in some random chasm with a bunch of Oxium geodes (you have to smash them with a hammer to get Oxium) and significantly increased my supply. Arriving at Syrtis Mons, I found "Dr. David Yellin," a geologist, who told me that the trio was looking for iron for Jack Segal's space cannon when his companions, Major Greg Duprey (a former U.S. cavalryman who fought Indians until he met one) and Richard Sherman (an explorer), became trapped in a cave-in. These NPCs are, of course, stand-ins for Britannia's Iolo, Dupre, and Shamino. They even use the same base portraits. This recurring trio also had doppelgangers (never fully explained) in Savage Empire, and as in that game, the characters react to their Britannian names. To free Duprey and Sherman, I had to assemble a drill, which first required a wrench. There had been a wrench among the supplies back at the capsule, but I had declined to take it, so with a groan, I hauled my party back to the capsule, got the wrench, and found my way back to Yellin. 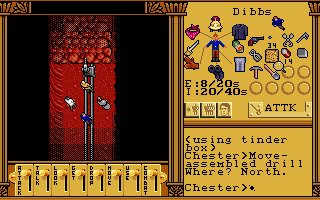 I put the drill together and shoved it into the nearby cave, moving it along tracks until we reached the cave-in. A few uses of the drill cleared the way. This game is turning into more of an adventure game than an RPG. Sherman joined my party and all three of them were happy to sign my voucher. I returned to Nathaniel with it and gained entry to Olympus. I leave you in that city, having spoken to Marie Curie, the actress Sarah Bernhardt (who has turned to painting in her new circumstances), and Theodore Roosevelt, who believes Rasputin sabotaged the cannon in 1893 and caused its premature discharge. Thomas Edison said that he thinks that power on Mars is broadcast from a series of towers controlled from a central location. The irony vis-a-vis Tesla is not lost on him. Unfortunately, Roosevelt won't join me. There are some ruins under the city with gears and control panels and whatnot that I haven't explored yet. Some comments from Admiral Peary suggest that I might have to melt the ice caps and re-flood the canals at some point. A man named Legrande Coulliard is preventing access to the Dream Machine in Olympus, but he'll let me in if I can find his brother, who was lost exploring Olympus mine. I've yet to see or speak to Jack Segal. There was too much to keep track of at this point, and I took a break. I have a feeling there's going to be some exhausting puzzle behind this. 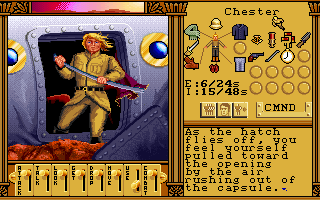 The game has a pretty jaunty soundtrack, credited to Dana Glover, Tom Hollingshead, and George "The Fat Man" Sanger. It's lost on me because I don't like in-game music, but I recognize its quality. Even with the CPU cranked, gameplay becomes maddeningly slow and stuttering when monsters are near. I continue to like the inventory system in this engine, both in terms of the types of equipment slots the characters have and the way inventory items work with each other. Lighting a lamp involves filling it with oil and then using a match or tinder box on it, for instance. Shovels and hammers are important tools. You don't often see this kind of complexity outside of roguelikes. 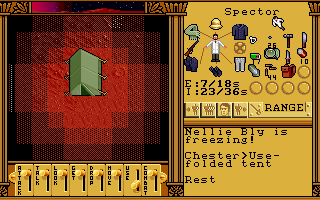 Unlike its predecessors, Martian Dreams has no food system. Nothing I've described throughout this entry suggests a game that I should hate, but I still do. The engine remains solid, but I don't care anything about this story. It was already done in Space: 1889 and it's not done cleverly in either game. 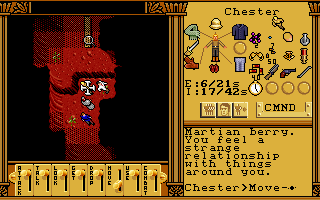 Wandering through the caves of Martian Dreams just made me wish I was playing Ultima VI again. 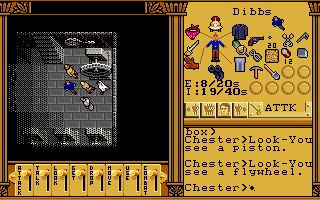 Oh, I'll finish the damned thing because it's an Ultima game, but I'm not going to be happy about it. Um, why does that work? Is it a bug? That might be the kind of thing I'd rather not know. Now I have to struggle to avoid using an exploit. It is probably a bug, but there really isn't any "advantage" to it, you just get to skip combats. Interesting take on the game. I can't say that I like this mangling of history. Take Rasputin, for instance, since I have read more about him than the others. There are dozens of documents, from Okhrana files, to the letters of Nicholas and Alexandra, to a biography by Rasputin's own daughter. 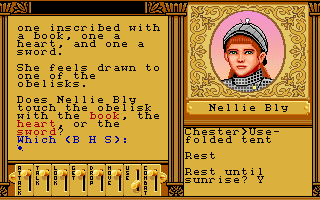 How could you summarize this into a character for a CRPG? The result is a summary of the character that distorts the historical record. The story may seem fun, but as an historian, this kind of shoehorning an historical person into a fictional story never seems to work well. This happens to every single book/movie on historical subjects and basically depends on the author/editor/scriptwriter/director to zoom in/amend/delete/preserve certain parts of their subject. They could be doing it to highlight a certain point (i.e. Alexander was gay, Ghandi was a pedophiliac philanderer, Reagan was a racist & etc. ), to make the story flow better or that the person writing the damn thing is just freaking ignorant. If ever there was a game you could skip with a clear conscience, it's Martian Dreams. Come on, haven't you learned anything from Fate? If you're clearly not having fun with a game, drop it or give it to a guest writer and move on. We won't think any less of you. Although Martian dreams should be over in less than 20 hours. It's longer than savage empire, but not terribly so. I can't not finish a game in the Ultima series. That wouldn't seem right. When I played Martian Dreams as a pre-teen, it seemed to be over far, far too quickly to me. I'm interested to see if the game really is as short as it felt back then. Take that as a consolation if you must. I'm disappointed that you're disappointed by it, though. Just the bizarre setting kept me going for the week or so it took to finish. 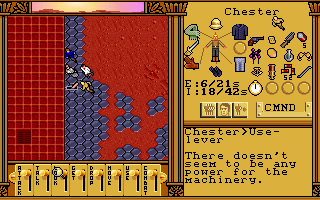 This is actually my favorite game using the Ultima VI engine. It's fun, silly, and lighthearted. The historical inaccuracies don't bother me. And if we can accept worlds full of dragons and elves, why not Victorian sci-fi. They're no less ridiculous. He had a similar response to the surreal apocalyptic setting of Wasteland. I wonder if the problem is that since these settings sort of wink at you and don't take themselves seriously that they are hard to really role-play. I say this as someone who doesn't really role-play during role-playing games. I approach them as strategy games with a story. And so I don't really care if the game breaks the illusion with some absurdity. But maybe I would if I was trying to immerse myself like that. "I wonder if the problem is that since these settings sort of wink at you and don't take themselves seriously that they are hard to really role-play." Yeah, there's something of that. But I'd think better of the game if it wasn't an Ultima game. It just fits poorly with the rest of the series and canon. I think it's better to consider it an "Ultima Engine" game and only consider the numbered Ultimas as part of the Ultima series. 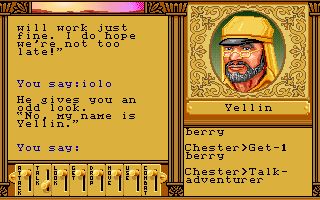 That would be easier if the game didn't insist that I was playing as arguably the most important RPG PC of all time. My whole argument is that if they wanted the use the U6 engine to tell goofy stories, they should have made up different PCs. If Darth Vader had shown up in Rogue One and done the Funky Chicken, tell me that you would have been okay with it because "it's not part of the main series." I see your point, it's like bad fan fiction, except it actually got published by Origin. To be fair, the other Ultimas had their share of goofy stuff -- though by this time, they tended to mix it with their pretty progressive storylines. But if this came out around Ultima II or III, then it would be kinda similar in tone. I've seen Vader doing the moonwalk in Disney on Ice though. The Brave Little Toaster is a terrifying movie for anyone under the age of eight. I saw it when it was first released and I'm scarred for life, to this day I refuse to have a toaster in the house. I don't have anything constructive to add about Martian Dreams, but I'm looking forward to Magic Candle II. I've only ever played the first one, never the two sequels or the spin-offs. Magic Candle II was great; an improved interface over the first one and still a grand adventure although not quite as "classic" as the first. The third game further improved the interface but I could never beat it; it was just too buggy and I didn't have access to patches. Anyway, I too am excited to see the Addict play it and relive the experience. MC3 starts great, but vgf raqvat vf ybat-nff qhatrba fybt. And then there's the spin-off, Bloodstone, which is arguably the best one in the series since MC1, but it does away with some survival mechanics, making the game simpler. Bloodstone was the only one I played (I was 14 or so), and it seemed pretty good, but I broke the economy by leaving my characters baking bread overnight or something, and as a result could fully outfit my level 1 party in quality gear. Goodbye item progression. Well, MC games don't have character levels per se, and, if memory serves, there isn't much of item progression anyway. Not in the sense that is used in modern games anyway. They're kinda like Realms of Arkania in that regards - there are some very rare magical weapons, but there wasn't that much of a difference between regular ones. Not to mention that they can break. The economy in Bloodstone suffers primarily from the fact, that you don't loose energy while moving, and therefore don't have that much need for sermin mushrooms, which is a huge money sink going out of the window. I loved the MC3/Bloodstone engine, but I never got to finish MC1 and felt bad playing MC3 without it. Maybe I should finish Bloodstone instead. Wasn't there an issue with Bloodstone that you arrqrq bar ACP sebz rnpu enpr gb svavfu gur tnzr? That was definitely an issue with MC3, but I don't remember whether Bloodstone was the same. Neither MC3, nor Bloodstone share any plot connection with MC1, so there's nothing to feel bad about. MC3 has some common NPCs, but that's negligible. Bloodstone is completely standalone. I'm not sure how importing works between MC1 and MC2 - the character system from MC2 onwards is completely different from the original game. Personally, I never played MC1 myself, and haven't got very far in MC2 (the necessity to change formation each time the party hits a narrow corridor killed it for me). I started with MC3 and then got to Bloodstone - and never had any problems with that. I was going to try MC1 eventually, but then the Addict's coverage happened. I really enjoyed Martian Dreams as a 15-year-old, more so than Savage Empire, but I always preferred high fantasy and classic sci-fi to something like Land of the Lost. Would I have the same opinion as the Addict now? Hard to say. It's just a game, after all. I think I would still appreciate the unique setting of the game and the call-backs to the Ultima series (given the "Dream" aspect of the game they do have some good call-backs to the main Ultimas, mainly I am thinking of some interactions with old villains that I always appreciated and still remember today). I hope that the some appreciation is achieved by the end! 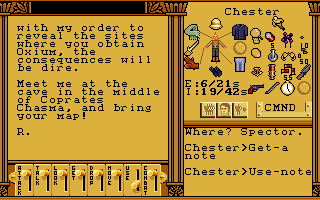 I do remember having some issues even in the original version of the game with saving or corruption; I never knew it was related to saving near the equator. Regarding the confusion over why "love" equates to Dexterity--this is just carried over from the Ultima games (starting with V or VI). The three Principles (from which the Virtues are derived) are Truth, Love, and Courage, and there are three main attributes in Ultima, Intelligence, Dexterity, and Strength. Truth is associated with the Lycaeum and Mages so it governs Intelligence; Courage with Serpent Hold and Fighters so it governs Strength. Love is associated with Empath Abbey and the only remaining attribute is Dexterity, so there you have it. The class based Compassion (pure Love) is the Bard which historically has a high Dexterity component to it. "Finding Cooter" - Sounds like my college years. Thank you, folks! I'll be here all week. I shall point out, somewhat at random, that the original short story The Brave Little Toaster is based on (by Thomas Disch) is extremely good. I've seen a little of the movie, maybe only 5 minutes worth; didn't like it. I guess, it's a fun ride, for a child with imagination. 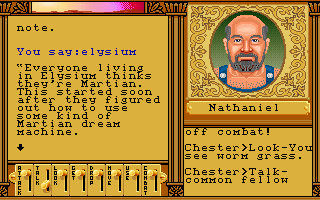 I would suggest that Martian Dreams requries more imagination to play than, say Ultima VI which is ye olde generic cod-medieval fantasy land that we've seen about 50000 times already in crpgs, and will see about 20 million times to come (and I'm saying that as someone who likes it). I'm not sure why Mr Addict has taken such a virulent dislike to the game and criticises it for not being set in the real-world version of Mars? It's fantasy Victoriana type game. Honestly can't stand this game's setting. Games can get away with a bit of absurdity, but when a huge chunk of the story and characters are intentionally goofy, I have no desire to engage. I agree with Tristan. Red_Cardinal is right, too, but my point is that Ultima as a WHOLE is not a "fantasy Victorian type" series and the Avatar is out of place here. I think The Worlds of Ultima series was meant to diverge to some other themes. And don't ever forget that the Avatar had to ride spacecrafts, travel through time & space and beat up a computer in the actual series. I can't believe anyone could tell me that the Avatar would feel out of place fighting dinosaurs or chewing rocks on Mars. No mention of this game would be complete without a shout out to Nakar's hilarious Let's Play of it, part of his series on the Ultima 4-7 games. Nakar's playthrough loses a bit through being archived, the commentary from other users was just as good as Nakar's. As he was wrapping up the final Ultima game, someone registered an account as Lord British himself, congratulating Nakar on his achievement. I doubt it was Lord British, but it was a suitable send off to an excellent series of Let's Plays. It is still possible to read the commentary, as the.original forum thread still exists. The catch is that you need to pay for a Something Awful forum account and then pay for the archives upgrade. Between your ongoing travails with ambitious German CRPGs and your antipathy towards this game's merging of sci-fi and fantasy, I'm looking forward to your coverage of Albion more than ever. It's too bad 1995 is so far away. Mento be patient. Why bother about Albion (I'm waiting too) if it is from 1995? Probably Chet will play this one not until 2022. I'm waiting for the hillarious rants about Spirit of Adventure, particularly the ending (if Chet gets to it, of course). Amberstar doesn't have a goofy setting though. And is generally very good. I'm watching Albion lets play in YT and damn if that game has a lot of wondering around but the story is quite something we haven't seen since and very well detailed as well. Game never got the credit it deserved at time of it's publishing which is a shame but then again -95 was already the beginning of Amiga's twilight years. 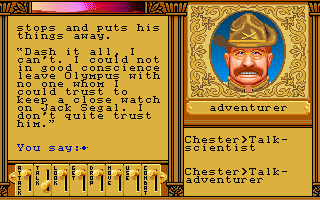 Jack Segal = Segallion, a recurring character in Ultima series: Ultima 5, Ultima 6, and Savage Empire. I'm amazed I didn't realise that when I played this. Seggallion is originally from another Origin game, Knights of Legend. The Seggallion of U6 is the same character, who wants to go back to his world. "I will play this damn game for completeness but I refuse to enjoy it" is basically the mating cry of a certain level of gaming enthusiast. I have definitely been there. A bit sad that Inez didn't get to finish her adventure. I love how much you hate this game. I still enjoyed it myself even though I don't disagree with any of your major criticisms. I think I was still enough in love with the interface to pull me through. The main issue for me in this one was the pointless trekking back and forth. I tried to plan ahead but would inevitably find I'd guess wrongly as to what equipment I would need (I'm pretty sure I had to go back for that wrench as well). There's not as much variety in the world as there was in Savage Empire to make up for it. Still, there's something compelling about piecing together the story in the standard Ultima way and the game's not too long. Oh... wow. I've been waiting for you to finally get to this game, and thinking how much you will love it, because it's such an amazing title. It wasn't until I read the first couple of paragraphs and opened up the links to the previous attempt (which I had read, but forgotten about), that I remembered your visceral reaction to the game. 1. The setting is a masterpiece of imitation. Just like Savage Empire, what you've got here is a tribute to the sci-fi novels and films of the late 19th and early 20th century. The supporting cast of characters is chosen very much in the spirit of homage to that time period. Perhaps one way to increase your enjoyment of the game might be to actively look out for references to period sci-fi works - there is a heck of a lot of them. 2. The background cast is absolutely amazing. Now, you have already pointed out that the characters are fairly shallow in characterisation. This is true, but I think this is an "uncanny valley" thing. Characters in other games of the period were not better. I daresay, even most Skyrim characters are not better. What's different here is that you have characters who are based on real people, and this raises our expectations. Because it's Tesla, we somehow expect him to be like Tesla, and so on. Yet, look at the amount of great background content and characterisation that was present in the game even as it is. Nellie Bly can tell you about her past assignments. 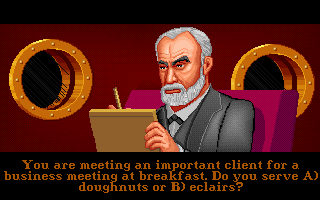 Virtually all of the other characters also reflect their activities of the time - and isn't it wonderful to be able to talk to a pre-presidential Roosevelt? Or to encounter so many characters who today are mere footnotes, at best? The research behind the game is astonishingly impressive, particularly in the pre-internet days (BTW, regarding Dallas Garrett - it's no spoiler to reveal that he has some dialogue in response to Lord British, so presumably that's the reference here). 3. The setting, again, this time not as an homage, but as an act of imagination. Plantimals! A civilisation of sentient plants that lives in glasshouses and uses automatons to take care of their underground work. Life on Mars is not just a jumble of random ideas, silly selenites or, ahem, little green men. Instead, you've got a ridiculous, crazy, but wonderfully consistent and complete “what-if” of evolution going in a radically different direction, where plants somehow develop into all these diverse mobile groups, while animals are limited to a few primitive (but perfectly adapted to their environment) worms. And then there's the dream machines and the like. I would actually go as far as claiming that in terms of its setting and story, this is one of the greatest science fiction video games produced to date. Ok, I think I've probably written enough, given that your dislike of the game stems from personal taste, and I almost certainly won't be able to influence it by pointing out that the wonderful thing about the game is how brilliantly it imitates the works that, presumably, you hate equally ;). Oh, one other thing. Just like in U6 and SE, the game keeps track of what you've done and are doing - which helps enormously when you're feeling underwhelmed by the open-world that doesn't quite point you in any direction. Just ask Nellie Bly about notes. Also: look for collectable bottles which are occasionally produced by dr. Blood's oxygenation machine at the 1895 landing site. They are very useful, to say the least. Careful about spoilers in the future, please. Fortunately, in this case, I've already played ahead of my blogging and know about the plant thing, but I'd be pretty annoyed if I hadn't. "Perhaps one way to increase your enjoyment of the game might be to actively look out for references to period sci-fi works - there is a heck of a lot of them." Perhaps one factor in my antipathy is that I don't really know this genre very well. I wouldn't know the references if I saw them. I do apologise if it sounded like I'm spoiling anything - I was actually very careful to only mention things that you either already encountered, or were discussed extensively in the game manuals. I don't think it would be reasonable to be annoyed that someone reveals something you're supposed to read before you start playing the game :). "Perhaps one factor in my antipathy is that I don't really know this genre very well." Well, from what you wrote, I get the impression you probably would find these works equally off-putting. Maybe once you finish, I'll comment a bit more on the details of the many references you find here - right now, I don't even want to mention any names or titles, because it's very hard to do without spoiling something about the storyline. Regardless, it's great to read your take on one of my top favourite RPGs. I mainly lurk here, because most of the games you've reviewed since I discovered your blog have not been of interest to me (and there's little point adding comments to earlier entries). But I've definitely been looking forward to seeing how Martian Dreams fares in your GIMLET. Yeah, that ending was pretty slick imo. Ultima IV keyed Truth, Love, and Courage into a Venn Diagram with the 8 virtues resulting from a combination of the three. The 8 character classes tracked the 8 virtues, and each class excelled in some combination of the 3 attributes (Strength, Dexterity, Intelligence). Since Strength and Intelligence were assigned to Courage and Truth, respectively, the only attribute left was Dexterity. So Love = Dexterity! Too bad they didn't ever do Worlds of Ultima: Arthurian Legends..
LOL! That's rich! I can't remember... was that Wasteland? That I don't like this game doesn't mean I wouldn't have been interested to see how they would have handled that. 1) Nice to see you get back on this one. I loved this game as a pre-teen. We don't share the same perspective on it, but it's nice to see it get a review/play through. 2) Fun fact, Disney actually was responsible for the Brave Little Toaster, and John Lasseter (currently CCO of Pixar, and Disney animation, CCA at Disney Imagineering) actually worked on that film, and did some really early CG on it when he initially worked for Disney in the early 80s. He was essentially let go from Disney, joined a nascent Pixar as their only animator, and then eventually was the director and one of the primary creative forces on Toy Story. TL;DR when Pixar was bought by Disney in 2005, John was handed the reigns of Disney Animation (the aforementioned CCO titles) and the creative side of the Disney Parks. So, both Toaster and Toy Story were essentially Disney movies, that were made with some of the same creative folks. One of whom now runs *all* of the creative stuff at Disney. Your wife has good taste imo. 3) It might help to note that this game came out in a period where adventure games were selling more than RPGs. 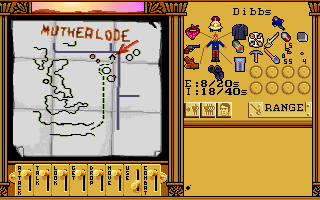 I *think* that's part of the reason this and Savage Empire were more in the style of Adventure games, with RPG trappings, than the earlier Ultima games which were true open world games. 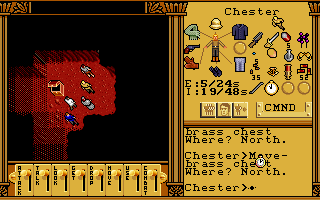 As someone that played this as a pre-teen, essentially, I preferred the more linear style of the Worlds of Ultima games, as compared to Ultima VI. I was able to complete the Words of Ultima games, but I couldn't beat VI then, without cheating, as the scope of the game was kind of outside of my mental abilities as a 12 year old. As an adult games with that scale present no issue, but at the time the more linear nature of the WoU games made them easier for my pre-teen brain to grasp. Think that's it. I'm tempted to send you a 5000+ word counter point review of this and Savage Empire :-). Those were, indeed, fun facts. Go ahead and send the counterpoint. I'll probably agree with it while still having a viscerally negative reaction to the game. Gah....not this one again. Things like this always hurt me in my history bone. They have so so MANY historical figures jammed into this game that I 1) couldn't care about any of them. 2) wonder what historical insanity could have gotten them all in this in these forms. I mean...why is Marie Curie there...in our timeline she was JUST finishing her physics degree in Paris in 1894...why would she even be in Chicago of all places? Rasputin is wandering in Siberia....Roosevelt is heading up the Federal Civil Service Commision I believe...soooo I guess he could be here but the Rough Riders (whose uniform he is in) don't get formed until 1898 during the Spanish-American War.....ARGH I don't want to play this game...I want to read their history books to find out what the hell's going on. Sorry but I am attempting(and failing) to write an alternate history fantasy/steampunkish story....I'm kinda fixated in the "who/whats would still exist" logic. MY apologies I meant Marie Skłodowska obviously since she didn't marry Pierre Curie until 1895! Seriously, these are the things that bother me, too. Well, I'm pretty sure we didn't colonize Mars in 1895. So I'm pretty sure the alternative historical timeline split way way earlier to allow the technology possible for this endeavor to happen. Meaning that those familiar names are just that, familiar names. Except thats ALL they would be really...we wouldn't have Marie talking about radiation...Roosevelt wouldn't be Rough Riding most likely....they would be different people themselves....or the split would be too close to change them or history appreciably. Not to mention them being a huge group of familiar names who happen to match up to the orignal descriptions of those familiar names. Seriously this is like winning the lottery 15 times in a row!?!? If we're talking about parallel universes, then (theoretically), that would be possible in one of the infinite number of universes. In fact, in one such parallel universe, YOU would have won the lottery 15 times in a row. No we were talking about timelines and ripple effects. Parallel universes are beyond the scope of this since we have no clue how they would actually work if they did exist. We can only posit from the universe that was presented to us here. To wit...."I want to read their history books to find out what the hell's going on. " I could accept that they are all here and in their most familiar incarnations. What I can't accept is how they are all just plopped in front of us like parade floats...i feel like I should lift my shirt to see if I can get beads! Throw me something Teddy! Hell the thing that really REALLy surprises me is that Butch and Sundance didn't show up on Mars to try and hide out instead of Peru in this timeline. Wait no...that one still would made some semblance of sense. Eh? I thought alternative timelines are about parallel universes? I'm not trying to defend Origin for placing 1-dimensional characters in this game, I'm just explaining that it is fully plausible to have a "what if" universe where most, if not all, characters retain most, if not all, of their traits and temperaments despite a huge change of the general environment. But in a fictional enviroment you have to EXPLAIN how any major changes or adaptations to the original historical system took place. You can't just drop a pile of historical characters in because they were alive in our timeline and expect it to be just accepted by everybody. People who know the history will want to know how the heck that was possible at all and people who don't know the history will still find it strange. Basically what I'm saying is the characters are not the only thing thats written one dimensionally. For example If I wrote a story where Bill & Hillary Clinton, Sarah Palin and Donald Trump were all wizards at Hogwart's but in an alternative timeline where Wizard's ruled the world and science existed as a hidden sideline unless I'm trying to write humor I'll probably need to do more than just say "its possible" while putting all that in a story about interdimensional cows wanting to rule the world. Its not actually a deal breaker...but it certainly doesn't help. Its like someone constantly punching you in the arm every five minutes while your eating...the food COULD be very good....but your arm still hurts and if the food isn't good enough to make up for the pain...well you stop eating. Hahaha, Martian Mardi Gras indeed. This Regina Sharpe and I are on the same wavelength. Chet, at the opening paragraph in your GIMLET of Savage Worlds you wrote that it, "...would have been better if the creators hadn't tied it to the legend of the Avatar." You then further elaborated that, "...we don't even try to mentally work it in to Ultima canon. We just shrug and keep playing." Now, I'll admit I haven't played either Worlds of Ultima game yet, so I suppose what I'm seeking is further clarity. In the previous one you were able to weather the complete dissolution of the "player character is the Avatar" theme with a measure of grace and resignation. You sort of chalked it up to Origin is as Origin does. You shrugged and kept playing. Here, however, your animosity to the whole thing is raw and passionate. You've been unable to divorce it from the numbered Ultima canon like you did before, and your earlier responses to commenters in this post bear that out. And so I'm left wondering, why now? Why didn't this affect you so negatively in Savage Worlds, which by all accounts - to an outsider, mind you, reading your blog posts - possesses an equally goofy story set in an equally goofy world that doesn't fit well with the Ultima trappings of medieval fantasy and is populated by equally goofy caricatures (a Three Stooges cameo in the Disquiqui tribe, seriously?) instead of fully fleshed out characters? Is it the sci-fi setting overall? Or the fact that most of the characters are historical figures? Is it something that's more subtle, yet it acts as the proverbial straw to the camel's back? Or is it something I'm just going to have to play and see for myself before I truly understand it (FWIW, this game and Savage Worlds are on my list)? Thanks in advance if you're able to reply. To be honest, I think this one is worse than Savage Empire. The plot of SE wasn't QUITE as absurd (at least, not in the whole probable impossibility/improbable possibility way), and at least I could enjoy it on its own if I tried to forget the "Avatar" aspect. I don't really even enjoy Martian Dreams AS A STORY on its own. The poor-use-of-historical-figures thing is probably part of it.